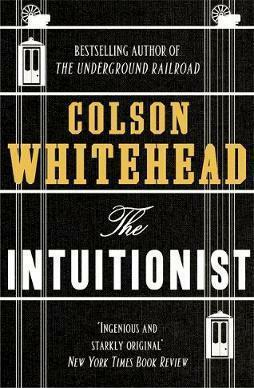 We're pushing forward with our readings of Colson Whitehead's The Intuitionist (1999). We've been paying careful attention to the vocabulary in the book and the memorable sentences. In the past, students here have said they like the book but got slowed down with the wording and the mysteries in the story. What about you though? From pages 33 - 65, how would you describe your reading experience? What have you found most challenging and most rewarding? This article helped me view birds as more intelligent. Previously I viewed birds as bothersome and not so smart, but this article helped fixed my judgment. For example, the article explains how Corvids use ants to help protect them from different pest and infections, which I found to be a very interesting and smart way to use their resources. Honestly, I found the talk about powerlessness or the dread of imperfection very intriguing. Comparing us to insects and conforming together to create a community also as known as the occupant's fallacy. Even the pigeon part was interesting, but I already read a different article explaining how they had right and left brains just like humans, so I already knew birds, in general, were pretty smart. Overall, I feel like this story is interesting and not too difficult to read due to word choice but still represents its mysteries throughout as it has only introduced characters such as Piefaced Anna. I've been able to follow the story line pretty well so far but I can definitely see where those students are coming from in saying they were slowed from the wording. There have been multiple passages in which abstract words are packed so closely together I have to go back and literally slow read to comprehend the the meaning. I've found that slow reading the most rewarding part about this book though, because it gives me this feeling of grasping the full concept of what the author is trying to say even though it's quite a challenge sometimes. The wording wasn't much of a problem as long as the context for it made sense. It was challenging to read certain parts, though. Page 52, for example, was almost entirely Lila Mae explaining the workings of the elevator. It was tempting to just skip that part, since it just seemed flat. The book is entertaining overall and relatively easy to follow, though. I would describe the reading as prosaic and informative. My interest was not grasped while reading and I can understand the former scholar's judgement of the novel. The hardest part of the reading was jumping into it and learning the characters and plot, the most rewarding was learning something new. I learned about different types of elevators and how they use gravity or energy to work. I am not a natural reader. Thankfully, I do not struggle with reading comprehension, but throughout my life, I have seldom found joy in reading. As for words; "bah dah bah bop baahh, I'm lovin' it!" I love being able to learn something, and then apply it directly to my everyday life. That's what language is for me. So when I focus on learning words from this book, it makes reading much more enjoyable. This part of the book was not hard to read because of the diction used. It was simplistic and the word choice made it easier to understand. I agree that this part does slow me down because I was confused on what elevators and insects had to do with the story being the hardest part. Rewarding was to understand how humans as a community was like insects and how intelligent birds are. For me, i didn't find the words themselves hard to read. It was more so the style of some portions. Page 52 had 95% of the page being about explaining elevators and it almost seemed like it eas a test ri see uf readers would just put away the book after the droning of the passage. My curiosity was liekly tje main reason i continued because it at least explained how each one functioned. Had it been more abstract for example the smell of an elevator; it would have been more challenging to take seriously. I've been able to keep up with the story pretty well, but I can see how the vocabulary can slow the reader down. I also think that the vocabulary makes it more interesting as well as difficult. I enjoy having to search the meanings of some of the words, it adds more tools to my toolbox. The words themselves aren't very difficult, nor have they slowed me down. They way in which the words are put together however has brought some degree of difficulty to the reading. Sometimes I'll have to stop and think about what I just read or reread it to better be able to comprehend it. I find it very difficult to stay interested in the book. This book does make me feel smart because of the fact that everything is so comprehensible. The book isn't too difficult to understand. For the most part I can understand the meanings all the words because of the context of the sentences. The "storyline" isn't difficult also. I do find it interesting to an extent though. The tricky wording did not throw me off of my game too badly, because as I said my vocabulary was already well off from my passion of reading other works and although there were several words that I was unfamiliar with I have a lot of practice in using context clues to figure out what a word may mean. This being said there were relatively few times when the more complex words and sentences required me to go back and reread over them or look them up to understand them. In pages 33-65 I really found the reading experience to be the same multiple new words to learn maybe even one on every other page, but I feel like my context clues and paraphrasing and critical thinking skills allow me to come up with the right uses for the words that might stump me at first, although it is kinda confusing the way they talk about all the buildings and such with labels as if you are there with them in that place and know which hall or building or chamber is where. Gabe G.
I can definitely relate to the students who have said that they were slowed by the wordings and vocabulary. I feel that same way in that there have been words that I had to go over and use context clues and even as far as having to search them up. That is the most challenging component of the book but the most rewarding part to me would be how me looking into the words and understanding them would enhance my vocabulary a lot more.